In his debut in the 140-pound division, three-division world champion Adrien “The Problem” Broner bounced back from the first loss of his career with a unanimous decision win (99-91, 98-92, 100-90) over Carlos Molina. Broner (28-1, 22 KO), who was fighting for the first time since his surprising loss to Maidana last December, started slow and was hit by a crushing overhand right from the confident Molina in the second round. While locked up in the third, Broner wrestled and tossed Molina (17-2-1, 13 KOs) to the ground, earning a hard warning by referee Kenny Bayless. 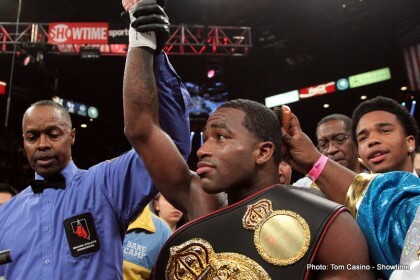 Broner picked up the pace in the middle rounds and took control of the bout with an impressive inside fight game. “I feel good. It was a comeback fight,” Broner said. “I shook the cobwebs, looked good and got the victory. Molina admitted to being frustrated by the speed of Broner. Broner trainer Mike Stafford praised his pupil for his performance in a new weight division. In the opening bout of the PPV telecast, J’Leon Love kept his undefeated record intact with a 10-round unanimous decision victory over Marco Antonio Periban, scored 95-93, 97-92 and 96-93. Love (18-0, 10 KOs) was effective with the jab in the early rounds before Periban (20-2-1, 13 KOs) floored him with three vicious exchanges. After barely escaping the round, Love turned the tables a bit in the sixth, landed a jab that opened up a deep cup over the left eye and cruised to victory. “Periban is a tough dude,” Love said. “It was a good fight. He has a very awkward style. He hit me with a tough shot and I knew it was smart to take that knee because he can be very aggressive.